SoftwareShield™ includes IronWrap, our sophisticated wrapper technology that protects existing applications without altering source code. SoftwareShield™ includes many innovative protection capabilities and will protect all your application files as a whole. Extensive anti-hacking/cracking, code obfuscation, cryptographic machine-binding, tamper-proofing, encryption, compression, intrusion-detection and several secret and proprietary methodologies are used to keep your content safe. 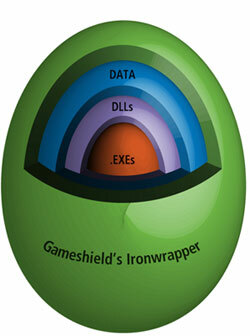 IronWrap essentially “wraps” a mini virtual operating system around your program like a protective shield. The IronWrap system may contain a pre-defined license model, logic, and customizable user-interface elements to allow the user to interact with the IronWrap system itself. IronWrap combines a multi-dimensional array of methods to protect your product is a highly secure package. Protections which explicitly attempt to prevent common attacks or actions which may assist a cracker. In addition to IronWrap protection, SoftwareShield™ also provides an SDK allowing for 100% customization to meet your needs. You can also choose to employ a combined or “hybrid” approach using both IronWrap and SDK features. In this approach you use IronWrap but also invoke SoftwareShield™’s SDK from inside your application. With this combined approach you can use a rich interface to communicate between your application and the outer protective layer of the IronWrap system, providing supreme flexibility with high-strength protection. FingerPrinting (or Machine Locking) refers to a mechanism which SoftwareShield™ uses that will uniquely identify a particular computer by its various hardware, features, settings, serial numbers, memory address locations, characteristics, etc. A FingerPrint is optionally used in the communication of Activation Codes to your customers to ensure only legitimate licensed users can use the codes you issue.